Google News & Weather has an interesting history. After years of being included on Android devices with almost no changes, it moved to the Play Store and received a Material Design facelift in 2014. 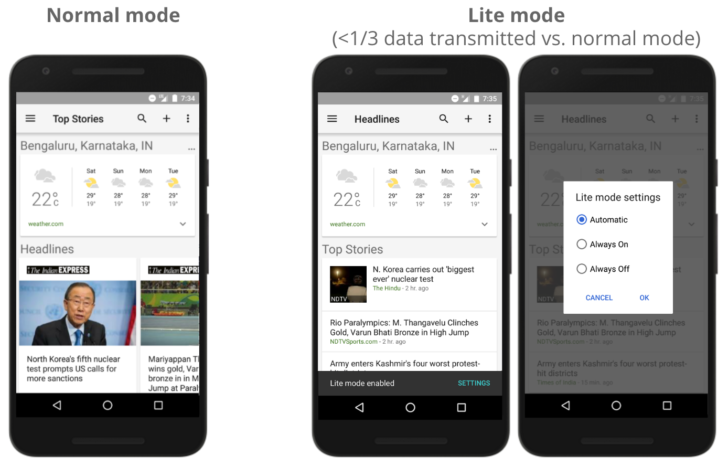 Now Google has added a 'Lite mode' to the application, designed to save bandwidth for users in India and other regions where data is at a premium. As indicated in the screenshot, you can set Lite mode to activate automatically, or force it on or off. When Lite mode is on, the application won't load as many images on the main screen. More importantly, opening a link in Lite mode causes an optimized version of the page to load instead of the full content. This uses Google's servers to transcode content on-the-fly for users, resulting in a new page with all of the important information, but none of the bloat. You can actually try this out for yourself right now. Just open this page on a mobile device, enter a URL, and tap the link to the optimized version. This appears to be a much improved version of Google Mobilizer, introduced almost 10 years ago, where Google's servers optimized pages for extremely basic web browsers on flip phones and similar devices. It is also important to note that Lite mode is not the same as the AMP pages you already see on Google search results. Webmasters must create AMP versions of their sites for that feature to work, but with Lite mode, Google's servers attempt to optimize the page automatically. The News & Weather 2.8 update started rolling out a few days ago (with this feature disabled until today), so you should be able to receive it from the Play Store normally. If you want, we also have it uploaded to APKMirror right here.